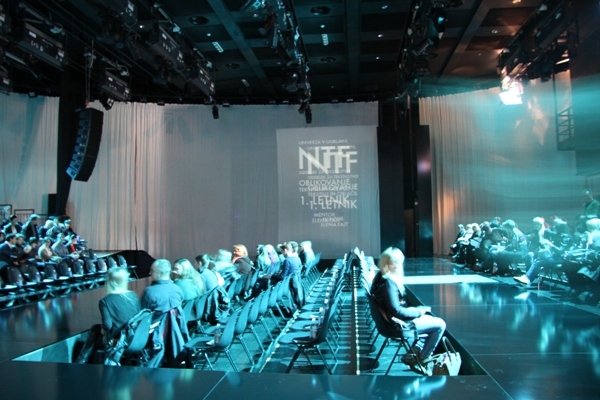 Second day started with annual fashion show by students from NTF (Faculty of Natural Sciences and Engineering from department of Textile in Ljubljana). First up were students from first and second year then third and at the and from masters fourth and fifth years. This year their fashion shows were a part of Philips Fashion week which was probably even more exciting for them. You could clearly see how much they learn and progress in years. So many young talented designers! Congrats for successful fashion show! The theme this year was Spominjam se/ I remember. Last year the theme was Krila/ Wings I wrote about here. Then at 21:00 the last show of that day started when other well known designers showed us their fall/winter 2013/14 collection. First let me start with my favorites by first year students. Wow was all I can say to first years. My favorite is the fifth picture by Kaja Golob, the structure it's just so interesting. I also like the second one by Teja Črnivec because of the hoodie but without the feathers please. Such an interesting choice of materials. I loved the last one with leather and plastic, these two together made a really interesting combination. Although I'm not sure how it would feel like wearing it. When the first model by Matic Veler (first picture) came out everyone around me was like waaaw! And I was one of them. The picture don't do it justice but the whole material around her head was sparkling so beautifully. The cuts and shapes of the dress is so amazing! It's not like you could wear it but I love to see pieces like this on the runway. It's art! Other favorite from third year was Vasja Lasič (the rest four pictures) with men's collection. It's such a wearable collection. Even I would love to have that soft black sweater. Looks so comfy. Day two was so long and full of amazing collections. I had to divide it in two posts or it will be too long for you to read. Check back to see masters fourth and fifth years and other known designers Urša Drofenik, Mojca Celin, Simona Lampe and Irena Funduk.